Yesterday was Republic Day in India, an occasion that honours the date in 1950 on which the Constitution of India came into effect. Across the city flags can be seen flying proudly as an assertion of the country’s independence. Today also marked the first day of teaching for our third cohort of MA students, as they commenced the second module of their course. Appropriately the day started with a dignified singing of the National Anthem by our students and Indian tutors, as Mary and I watched on in respectful silence. Unfortunately The Brindavan Education Trust where we teach lacks a flag pole; I must have a word with the management to see if we can make amends for next year. As they entered the teaching room this morning the students greeted each other and their tutors with warmth and enthusiasm, clearly glad to be returning to what promises to be a busy, but enjoyable week. The focus of the module to be taught will be largely built around applying inclusive planning, assessment and teaching approaches in classrooms, and within five minutes of the first session of the day it was evident that everyone had returned with new ideas, and questions that they wanted to explore. The second module on this course always appears more relaxed than the first, when students arrive not knowing each other and unsure about what to expect. Many have been familiar with professional development, and even degree courses, which are taught using somewhat staid didactic approaches, where they have been expected to sit in silence and take copious notes. For some, the first few sessions can be something of a surprise, even slightly daunting, as they find themselves engaged in active learning through a variety of problem solving tasks and debates that demand that they take a leadership role in their own learning. However, they soon relax, and begin to enjoy a situation in which they question their own beliefs and practices, and devise new approaches to understanding the challenges of inclusion. The concept of learning by doing is far from new, Socrates in the fourth century BC encouraged the development of critical thinking through questioning and challenging the issues of the day. 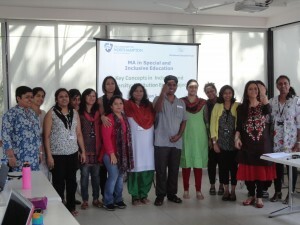 Our students on this course adopt this approach, and in so doing recognise that they are already in possession of tremendous knowledge and understanding, and are therefore able to utilise this as we examine notions of what it means to be inclusive, and how to foster more equitable approaches to teaching and learning. By the end of yesterday’s sessions our thoughtful and highly motivated students were already back into the routine of disputation, questioning, challenging and expressing their opinions that has come to characterise this course. These teachers are all superb reflective practitioners, who are able to take ideas and quickly translate them into classroom solutions for the benefits of their pupils in schools and colleges. 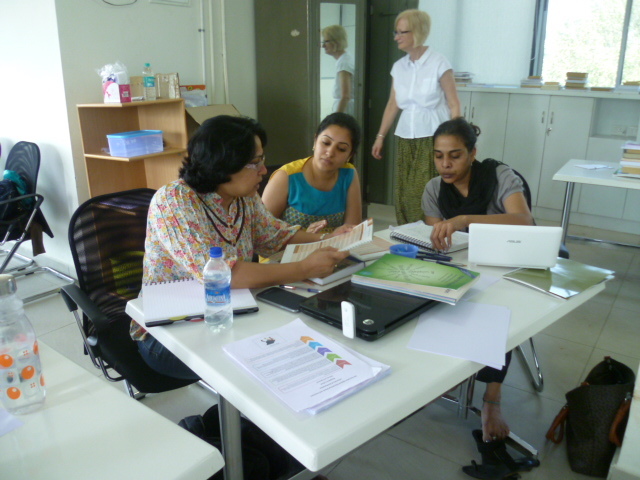 Their commitment to learning is a tremendous motivating factor for those of us fortunate enough to be their tutors. “The State shall provide free and compulsory education to all children of the age of six to fourteen years in such manner as the State may, by law, determine”. In 2009 the Right To Free and Compulsory Education Act was passed with an intention that this constitutional clause should become reality. Much work needs to be done before this is achieved, and these students will certainly have a major part to play. As tutors we have every confidence that they will make a significant difference to the lives of children who have for too long been marginalised. If these students are representative of India as a whole, then the Republic is in good hands. Establishing principles before embarking on practice. Examinations appear to rule education systems across the world. Not only do they dominate, but they are largely limited to an unimaginative written format that often fails to assess what they claim. Many of the assessment methods adopted in schools today do little to encourage learning, and some are a major obstacle to providing more inclusive approaches to teaching. 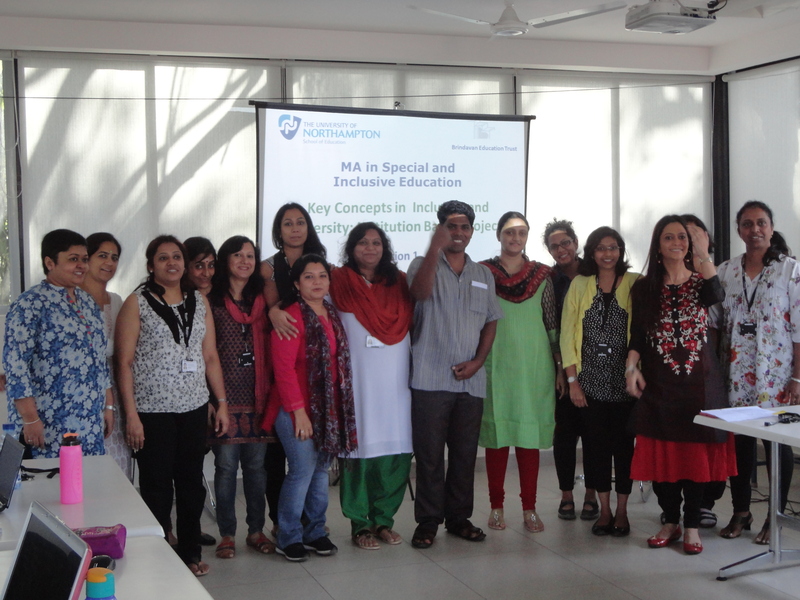 This theme was to the forefront of our minds today, as our latest group of students on the MA in Special and Inclusive Education here in Bangalore, got to grips with considering the relationship between assessment and the provision of an equitable education system. Assessment is obviously an important part of the teaching and learning process and the summative measures used at the end of a period of teaching can be useful in providing an overview of attainment and progress. However, when schools use only these summative approaches they miss an opportunity to really understand what is happening in the classroom and in the learning experienced by children. With this in mind today, Jayashree, Mary and Johnson have each challenged the thinking of our students, presenting them with ideas and encouraging them to debate principles of assessment alongside the mechanics of how this can be applied. A series of activities based around those principles of assessment articulated by, amongst others Tim Loreman, Joanne Deppeler and David Harvey, enabled our student colleagues to reflect on their own practices and those of their colleagues. As an observer of part of this session, on my return from visiting a school across the city, I was immediately impressed by the way in which well-established assumptions and ingrained practices were being challenged. Having been given the space to think and debate issues in a supportive environment, our students were soon developing innovative ideas of how the assessment procedures in their schools might change to become more inclusive. As they presented their ideas to their classmates it was easy to see that they have a high commitment to developing their own practice and experimenting with approaches which they hope will benefit both pupils and teachers. What we assess, how we do this and how the information from assessment is used were all questions considered. 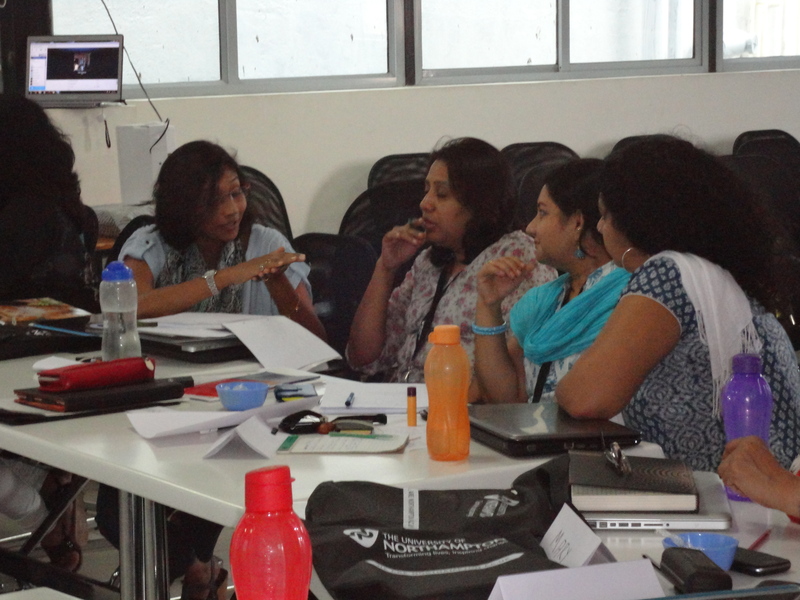 The formative processes of using assessment information and alternatives to simplistic pen and paper approaches found favour with all the class, and the examples they provided of how this might be further developed were greatly appreciated by all involved. 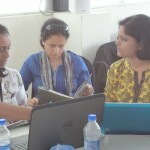 The concept of assesment as a celebration of learning may not have been debated by teachers everywhere, but here in Bangalore was discussed with considerable flair and enthusiasm. As I listened to what our students had to say and the ideas that they articulated so effectively, I appreciated that I was probably learning as much in this class as any of the them. The importance of starting from a set of principles, rather than simply following established assessment practices was an important part of the message that everyone took away from today’s sessions. If this applies to assessment, then surely it is equally critical in all other aspects of what we do in schools. This is a theme that we will revisit later in the week on this course, as we consider the role of children in the assessment of their own learning, and in appraising the teaching that they receive. With such reflective teachers, the delivery of this module is proving to be a real pleasure and I am sure that we will all continue to learn from each other. As I sit here writing, awaiting the latest downpour of rain that is most certainly on its way, I cannot help but think that if all teachers were given more opportunities and time to reflect upon the practices in their schools, it would be far easier to establish a more inclusive education system. This freedom, of course, is unlikely to happen and therefore we will continue to be dependent upon the professional commitment of small groups of teachers, such as these to ensure that progress will eventually be made. Thank you for a letter of appreciation. Teachers generally entered the profession to support children. Sometimes this means looking beyond their academic achievements. I always find it heartening to read about teachers who stand by their principles, especially when this is in support of their students. Teachers often work in a pressured situation where the agenda for schools is set by politicians and the expectations upon children are framed in terms that, in some cases can be intimidating or seem beyond their reach. Yet there remains a strong commitment within the teaching profession to maintain a focus upon the needs of individual learners and to celebrate their achievements and individuality. A few days ago on this blog I wrote about three lads from a local school who had spoken to me in gloomy terms about their impending school reports and examination results (It’s a school report – not a crystal ball! – July 8th). I had tried to be positive and reassure them that there was more to life than end of year reports, but unfortunately it seemed almost impossible to shift their negative outlook. At this time of year, when there is an expectation from parents, teachers, pupils and inspectors that schools will laud their academic achievements, it is all too easy to lose sight of the other ways in which children can demonstrate their learning. 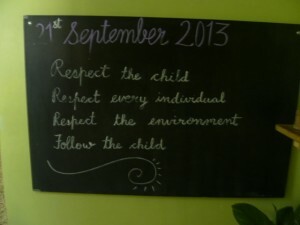 This is why I was delighted to hear of a head teacher from a school in the north of England who has taken an initiative to demonstrate how much she values a holistic approach to learning in her pupils. 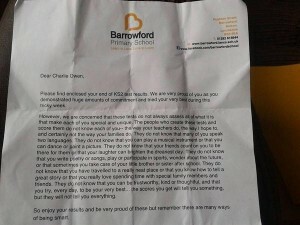 Rachel Tomlinson is the head teacher at Barrowford Primary School in Nelson, Lancashire, who as the school academic year is drawing to a close decided to send a letter to her pupils who had recently completed formal assessments . I reproduce it here in its entirety as I think it should be read by every exhausted teacher, anxious parent or concerned student facing the end of year results. Barrowford Primary School has just over 300 children on roll, and it seems to me that being part of a school managed by a head teacher who takes such an initiative must be a terrific learning experience. The school has adopted a motto which states – “Learn to love, love to learn”. Such sentiments can often be tokenistic, but here we clearly have, in Rachel Tomlinson, a head teacher determined to live up to this ideal. In recent years teachers in schools in England have often worked in a state of anxiety, in the knowledge that at any moment inspectors may descend upon the school and pass judgement upon the quality of their work and the attainment of children. The perception, one that has been sadly perpetuated by some head teachers, is that the only achievements that matter are those related to academic standards. 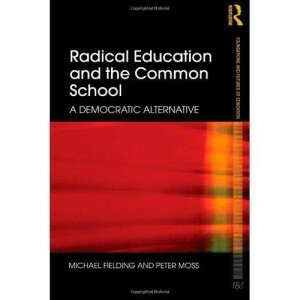 To stand against this regime and celbrate the learning and broader achievements of children has demanded courage on the part of teachers, such as that demonstated by Rachel Tomlinson and her colleagues. 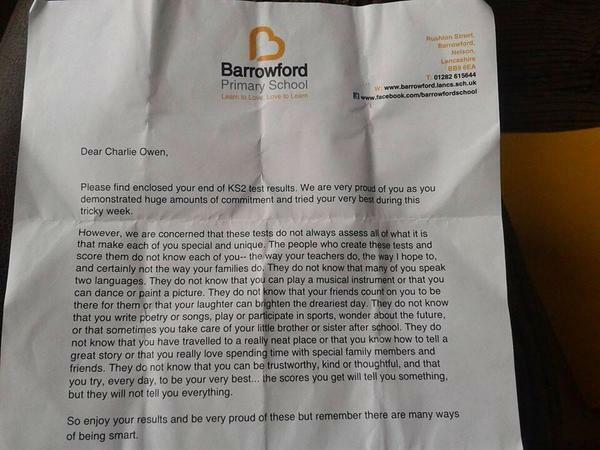 This letter certainly made my day, and hopefully had the same impact upon those children, teachers and parents who make up the Barrowford School community. It says so much about the values of the staff who work in the school and issues a challenge to those who fail to see children beyond the end of year results which schools are obliged to issue and report upon. As the end of term approaches I do hope that Rachel Tomlinson and her staff enjoy a relaxing well-earned holiday. They should do so secure in the knowledge that their commitment to recognising and celebrating the achievements of every child at Barrowford Primary School is appreciated well beyond the boundaries of Nelson in Lancashire. Do please vist the school website, available through the link below. Getting down to work to define a set of school principles to promote inclusion. On arrival at the Brindavan Trust training room this morning the warmth of greetings between students who have been apart for a few months was heartening to see. Equally reassuring was the welcome we received as tutors and the positive comments of anticipation about this week’s module. Whereas at the outset of the first module our students were apprehensive and a little reticent, today it took them no time to engage in discussion and debate as the second module got under way. Active learning is the order of the day on this course. I am a firm believer that students learn more when they participate in problem solving activities than they do by simply listening to tutors. This group of students respond with gusto to every task we set. They question each idea presented, interpret issues in light of their own experience and challenge each other and the course tutors whenever a seemingly simplistic idea is presented. Gauging the effectiveness of schools in addressing pupil diversity was the main focus of the day. Accepting that inclusion is a journey that follows many paths which twist and turn according to the influences of pupil need, teacher understanding and policy initiative, is it possible to assess the adequacy of the response of a school? Many efforts have been made to develop tools that it has been suggested might assist in assessing the inclusiveness of schools. Two of these, The Index for Inclusion and the Inclusion Quality Mark were scrutinised today. Students speedily identified the potential advantages and pitfalls of these instruments. Accepting that there are many cultural inadequacies in documents that were not designed for an Indian audience, they were none the less able to relate to many of the critical issues covered. Engagement with parents, the sharing of principles, involvement with the local community and respecting individuality are all factors to which the students could relate. However, in common with many other teachers they were concerned that this means of “measuring inclusion” was open to abuse and misinterpretation if simply used as a checklist to be ticked off in order to be able to describe the school as inclusive. A couple of issues provoked particular debate. When documents refer to parents is there a danger that this will be translated as “mothers”? 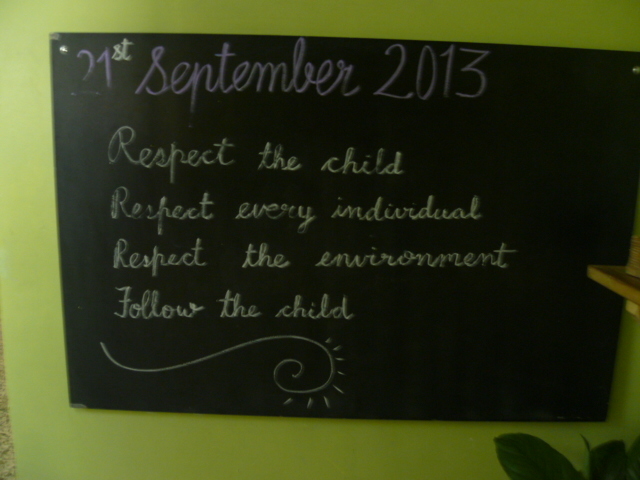 Child caring and educational responsibility is often delegated to mothers here in India as elsewhere in the world. Fathers can at times play a minor role on the periphery of schooling. This, our students suggest, can be a particular difficulty where a lack of male role models presents boys with a challenge. In some Indian families fathers are more educated than mothers, should they not therefore play a more active role in supporting their children? A more heated discussion centred on the idea of interaction with the community. Definition again presented difficulties. Should the school go out to the “community” or should the “community” be encouraged into the school? What is this community and how does it relate to the wider concept of society? Consensus on this matter was not achieved, and the questioning will continue throughout the week. 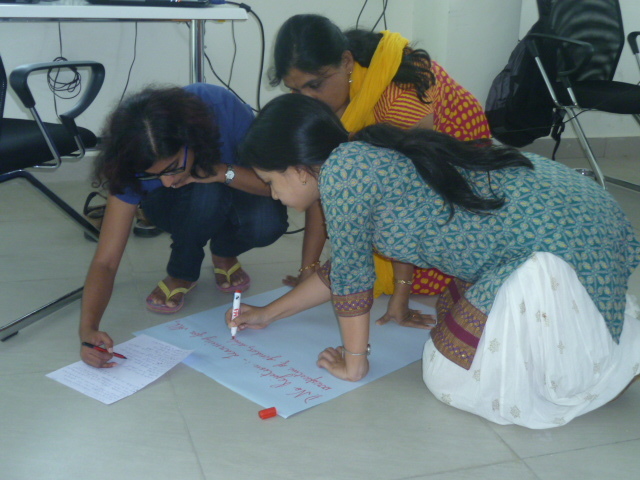 As a final activity of the day the students in groups compiled a list of principles for their ideal school. 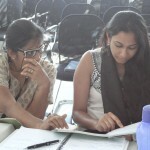 Many of the ideas expressed in each group were similar, though, as expected, each had their own unique take on what might be achieved. Returning to the Index for Inclusion and the Inclusion Quality Mark they concluded that these may be of help, but a far more valuable process would be to debate these principles in each school and develop their own approach to assessing success in addressing diverse needs. Throughout the week we will be referring to these principles as we consider a range of classroom management and teaching issues. Finally, a reflection on one question that arose today. One of the groups had a principle that stated that violence of any kind perpetrated by children or adults should not be tolerated. “But if there is violence in our school, how should we deal with it?” asked one of the students. Perhaps the way forward is to adopt a Gandhian tactic. When there is violence in school the Principal will fast until it stops! Not a popular proposal with most Principals I suspect. 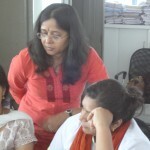 This was a highly stimulating day when teaching was at once challenging and rewarding. I look forward to the rest of the week.